Pocahontas paints with all the colours of the wind, and also hikes with all the lizards of the rocks. 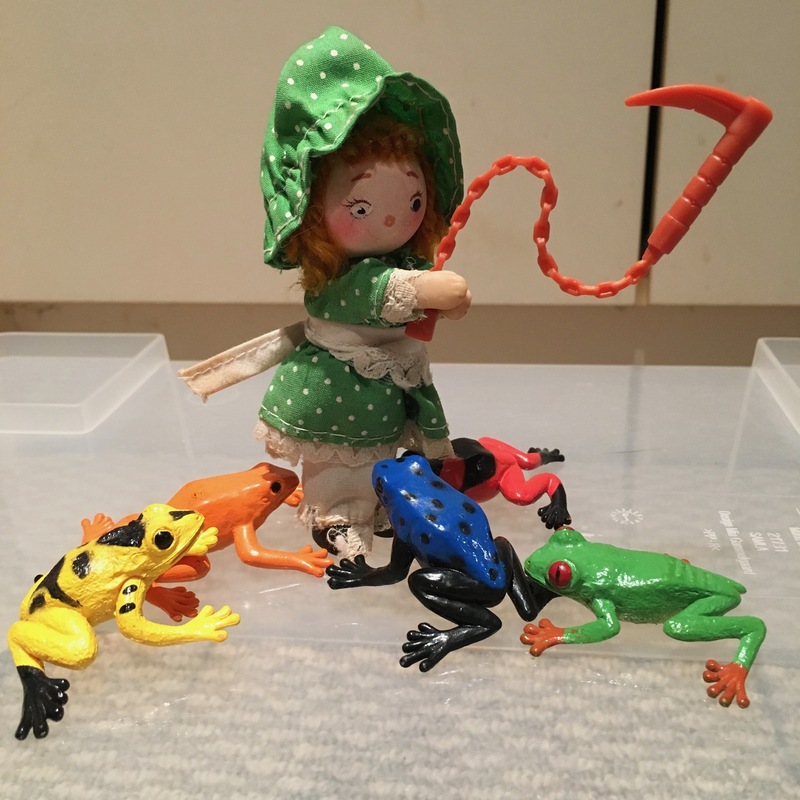 She summons them with a single glance. Lilliana knows the truth about Ravage: he may transform into a badass cassette tape, but underneath his robo-bilities, he’s just an old sweetie who only wants his jowls rubbed. Betcha didn’t know that when he’s done his shifts at Koodo, El Tabador moonlights as a monkey wrangler. 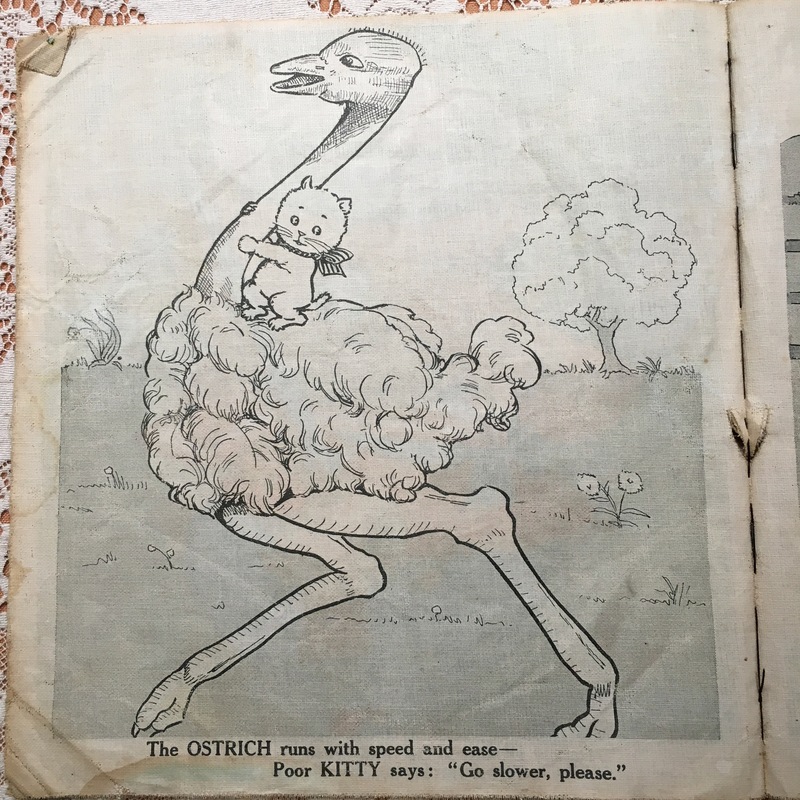 Antique Children’s Book, Animal Cutes: The plot thickens. If you thought the questionably cute critters in Part 1 were subversive, get a load of Part 2. 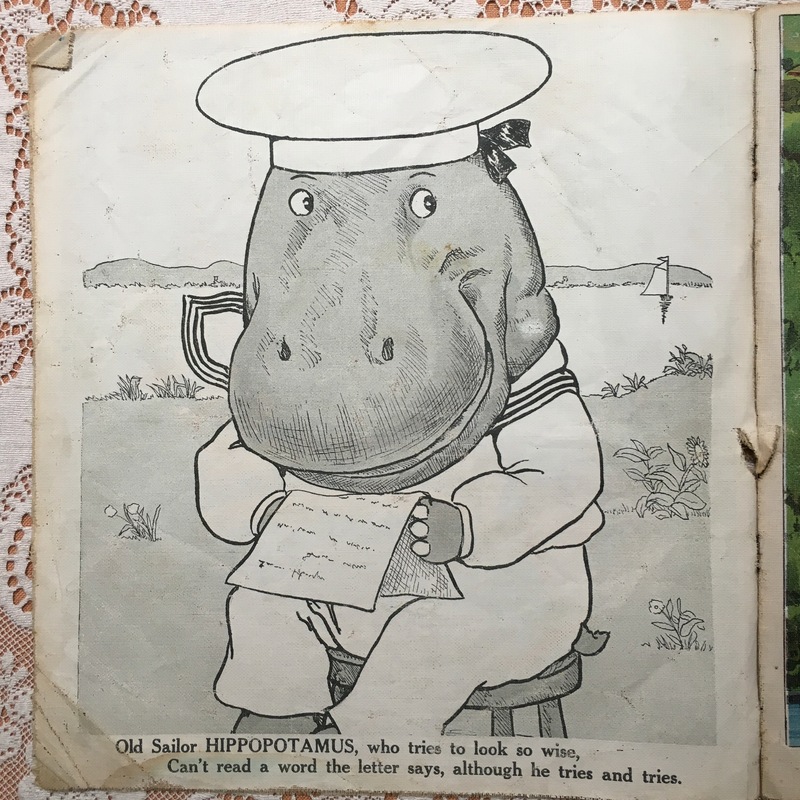 Old Sailor HIPPOPOTAMUS, who tries to look so wise, Can’t read a word the letter says, although he tries and tries. Hoo boy. So many questions. Why is the hippo a sailor? Why is he old and illiterate? Why is he trying to look wise? I have a notion that “Old Sailor HIPPOPOTAMUS” is actually a spy. It’s quite a skill to pretend you’re pretending to be wise while pretending you can’t read. And there’s definitely something shifty in those eyes. 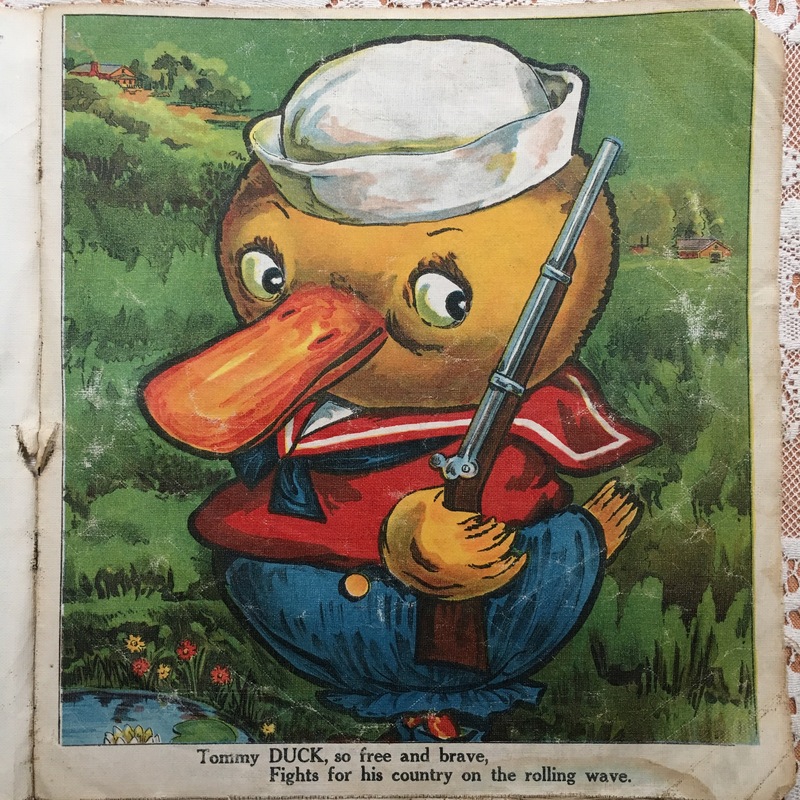 Tommy DUCK, so free and brave, Fights for his country on the rolling wave. Speaking of shifty… I think Tommy knows propagandist adjectives when he hears ’em. He does not feel free or brave in his floofy sailor suit. He has also probably discovered that he can’t actually grip a rifle in his feathery li’l hands, so that’s making him nervous. But hey, there’s no time like early childhood (or ducklinghood, for that matter) to start military brainwashing. If Tommy can fight for his country on the rolling waves, SO CAN I, right? As for Kitty’s ostriquestrian adventures, they are bizarre at first glance. How can this possibly be explained? Fortunately for you, I’ve done some research and figured it out. Remember the kitty from the front cover of Animal Cutes? Upon closer inspection, I’ve determined that the surrounding flowers are hyoscyamus albus, commonly known as yellow henbane, “the paramount means in ancient times of inducing a trance-like state.” Hence Kitty’s expression in Part 1. To see an ostrich in your dream suggests that you are not facing reality. You are in denial about something and living in a world of your own. There is something in your life that you are unwilling to accept. Make sure you have a good look at what is going on around you right now. There is a personal truth that you are not accepting for yourself. No wonder Poor KITTY is asking to go slower. For your own drug trip to be advising you to admit you have a drug problem is pretty heavy stuff. 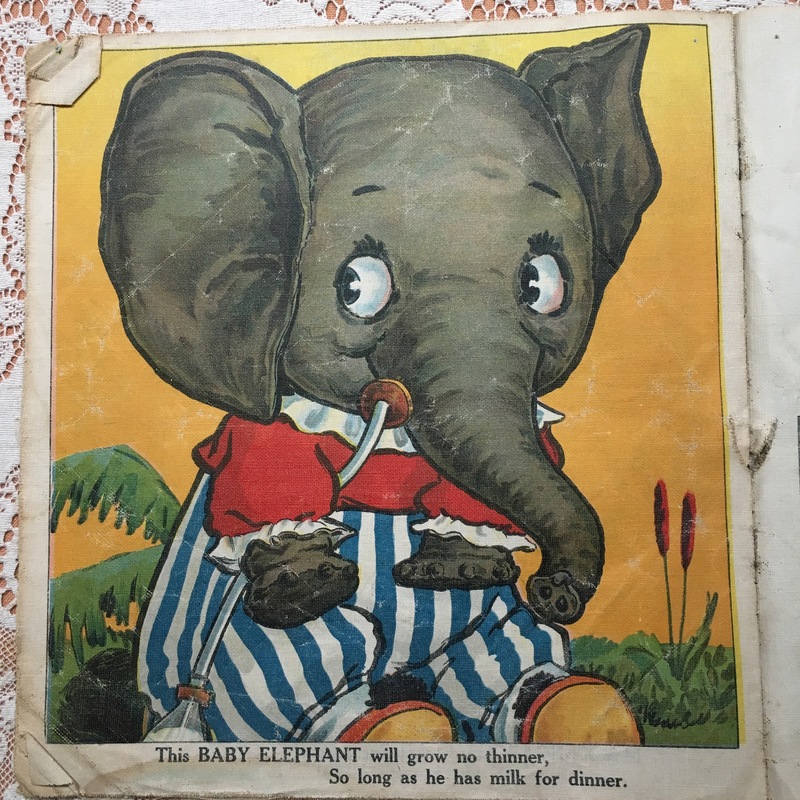 Bet you didn’t know you were going to learn so much, both academically and spiritually, from an Antique Children’s Book, n’est-ce pas, Di-hards? That’s just how I roll. You’re welcome. We all know from Toy Story that these characters don’t just lie still in the dark. They get up, have adventures, bond, and then cleverly put themselves back in a “just-got-dropped-here” position. Some of these friends have really become close over the years. 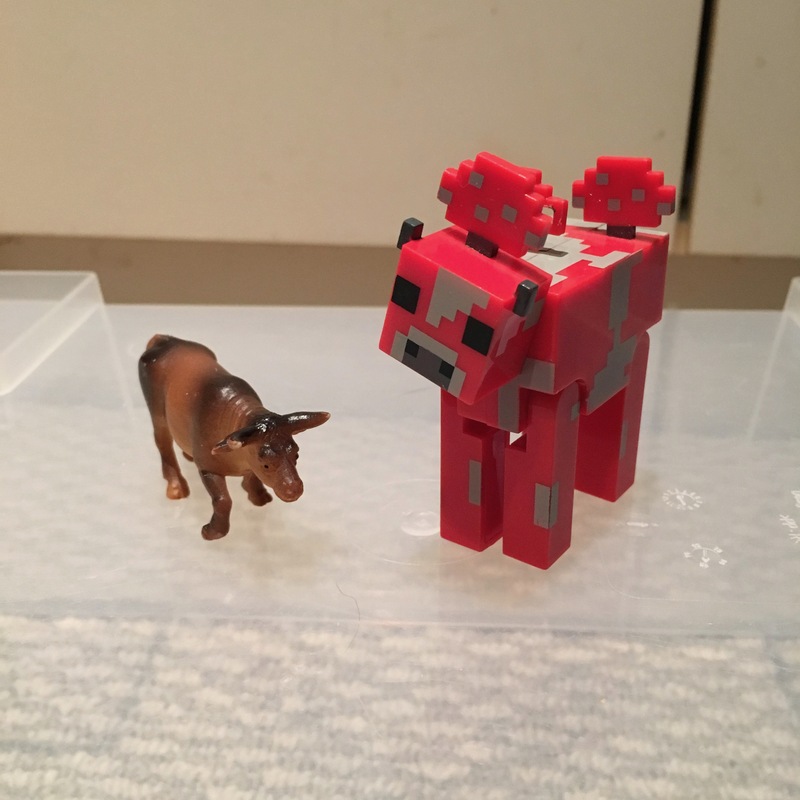 Mooshroom and Farm Cow know they’re different, but they’re kindred spirits too. 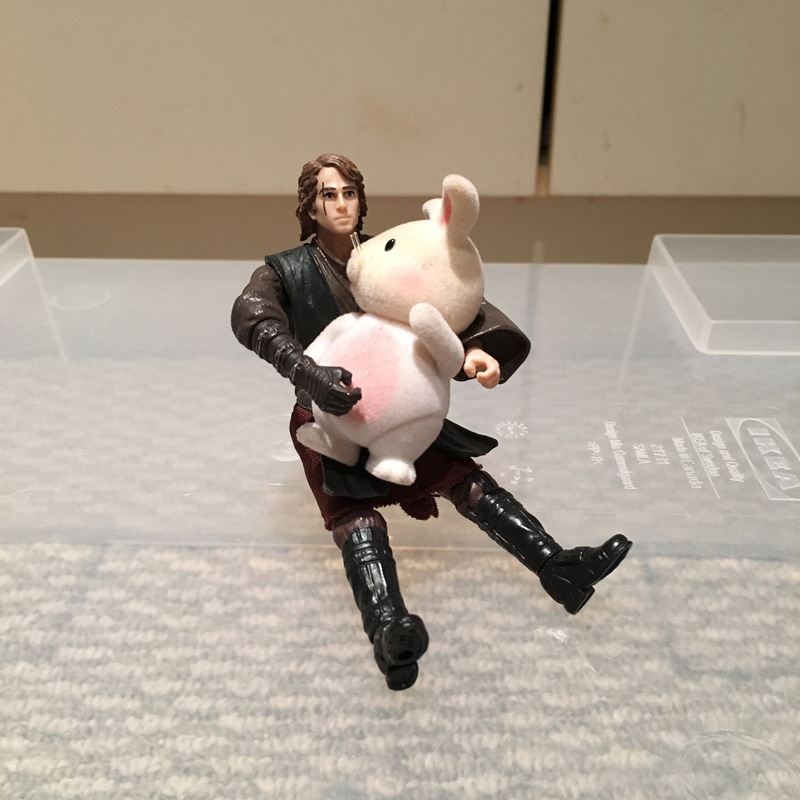 In an alternate universe, Anakin knows the soothing companionship of baby Theo Hoppingood. They tell each other everything and understand the value of cuddling. 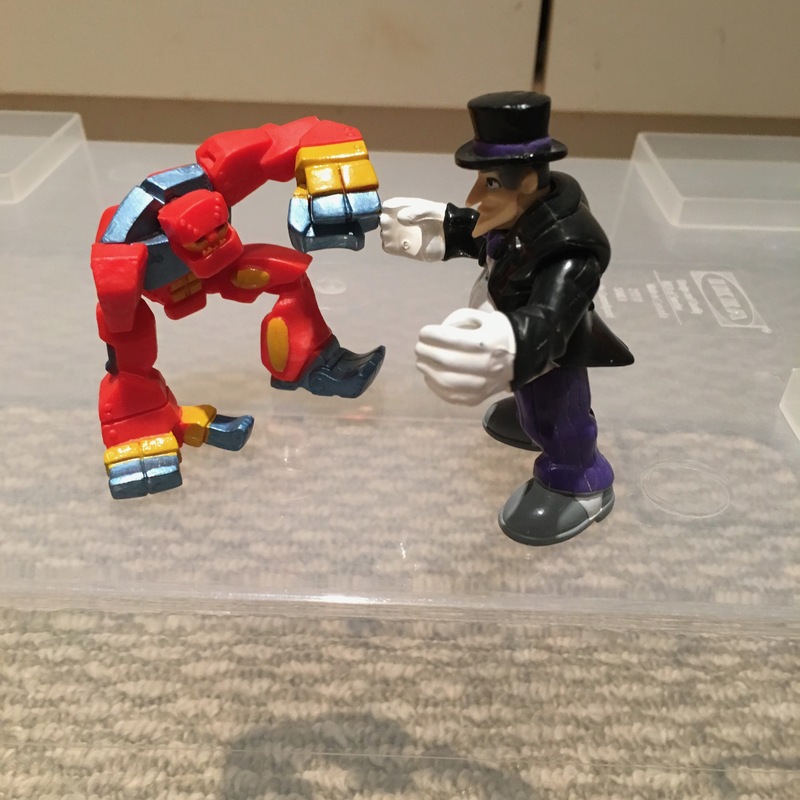 Math Robot and The Penguin are good buds, fist-bump-style. Rance Handsome and Roy Savage enjoy a quiet evening at home with Snowy, discussing the ins and outs of interior design and dump truck maintenance. Romance is in the air in our rec room! Today’s post is extra-nerdy, and kinda inappropriate. 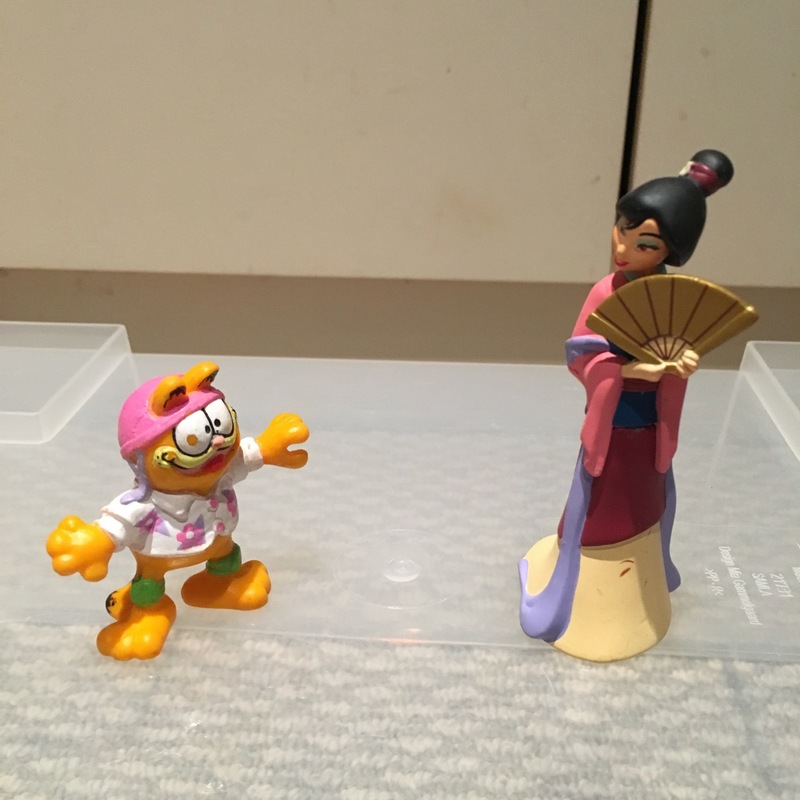 Mulan was pretty sure Surfer Garfield wouldn’t bring honour to her family… but she couldn’t deny a flicker of interest. Lord Garmadon had never felt butterflies like this before. He couldn’t believe she would grant him this dance. Ariel, on the other hand, was a bit weirded out by the sinister dude grasping her skirts. We thought Prince Hans was a sociopath, but he really just needed the love of a good woman like Yamuna to awaken him to romance. Yes, there’s more. It’s only natural that these friendships between toys develop. An act of true love will thaw a really effed-up heart. In this case, a CIRCUS act of true love. 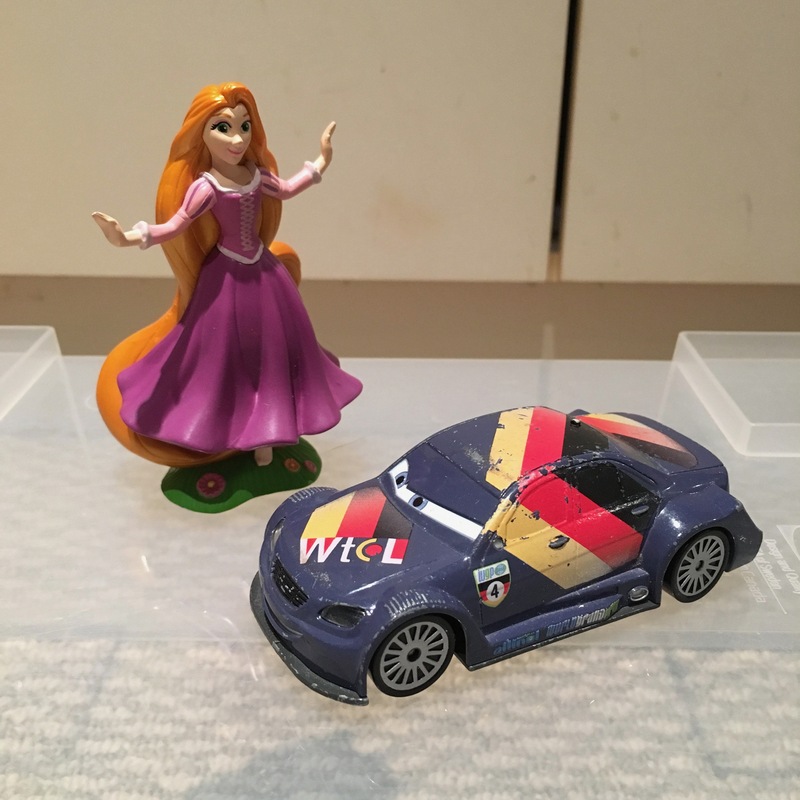 For her eighteenth birthday, Rapunzel wanted nothing more than to see the floating lights up close… And for her nineteenth, a rough-and-rugged race car. 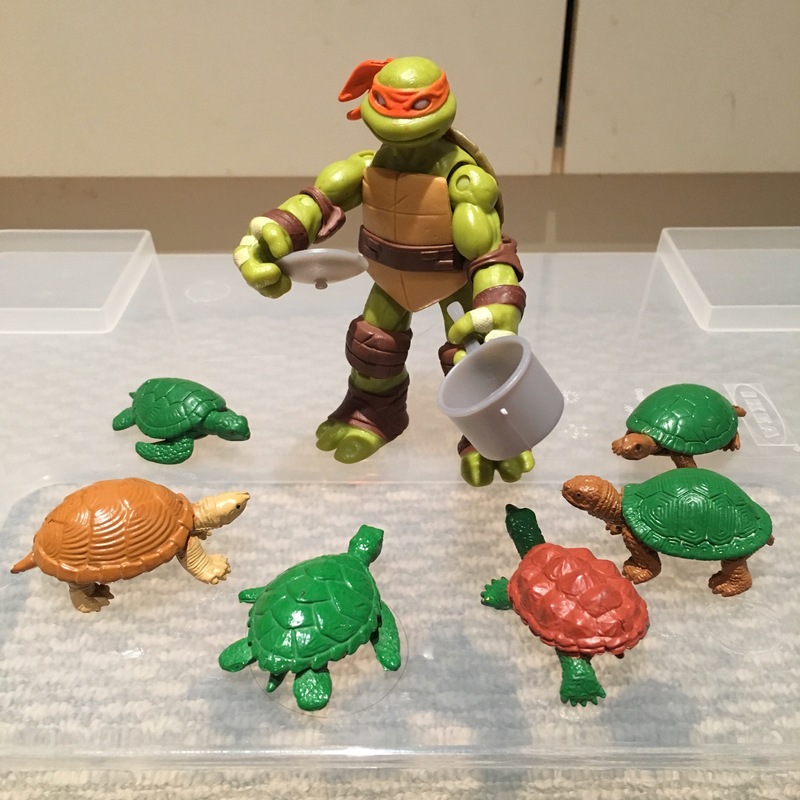 The turtles were impressed: Michelango, with his superior dexterity, had made a delightful seasonal stew. If you’re a Di-hard, you already know that I have nerdy tendencies. You know that I have young children. Sometimes when you spend the majority of your time with kids, your perspective warps a bit. This was bound to happen. NaBloPoMo Day 3. Stand together, multicoloured people and creatures of the world! You are beautiful. 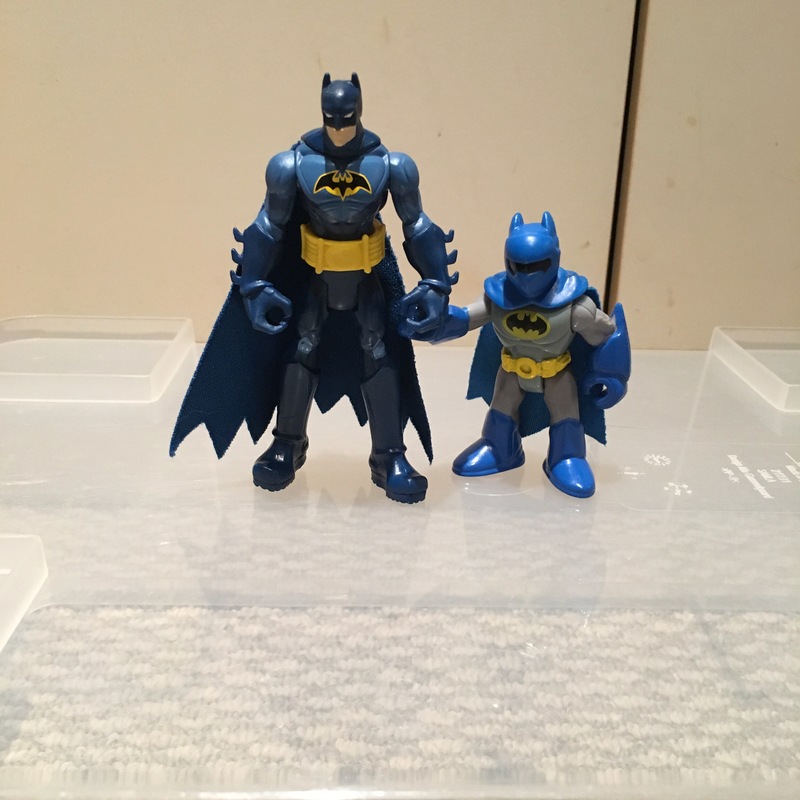 Someday they will end up in the Batmobile together and all pretense of safety will be abandoned, but for now, Batman and Mini-Me are quite careful crossing the street. 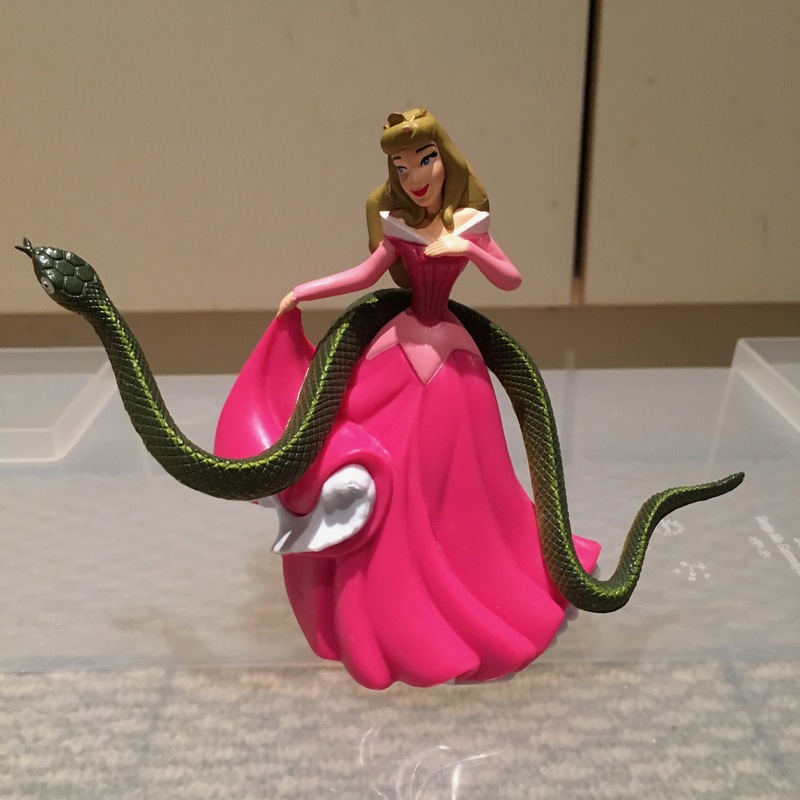 Things you never knew about Aurora: she’s a Parselmouth. Eight Grade 1 Boys Is Lots. Report cards and yearbook are finally done! 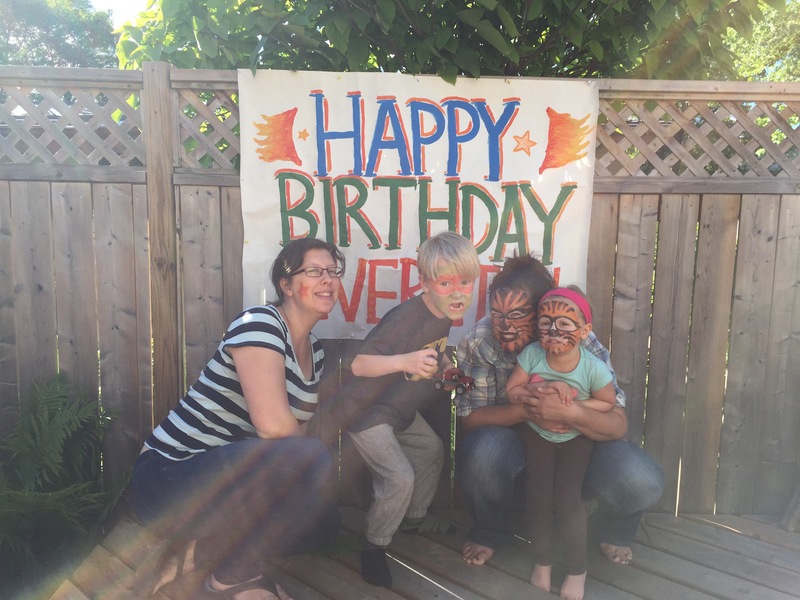 There was a lot of work to crunch into the short period since I returned from OELC (more on that later), but still doesn’t feel like as much of a survival accomplishment as MY SEVEN-YEAR-OLD’S BIRTHDAY PARTY. This is the first proper party we’ve had for him, with his friends from school. I feel bad that that’s the case, but I can admit I’ve been putting it off. 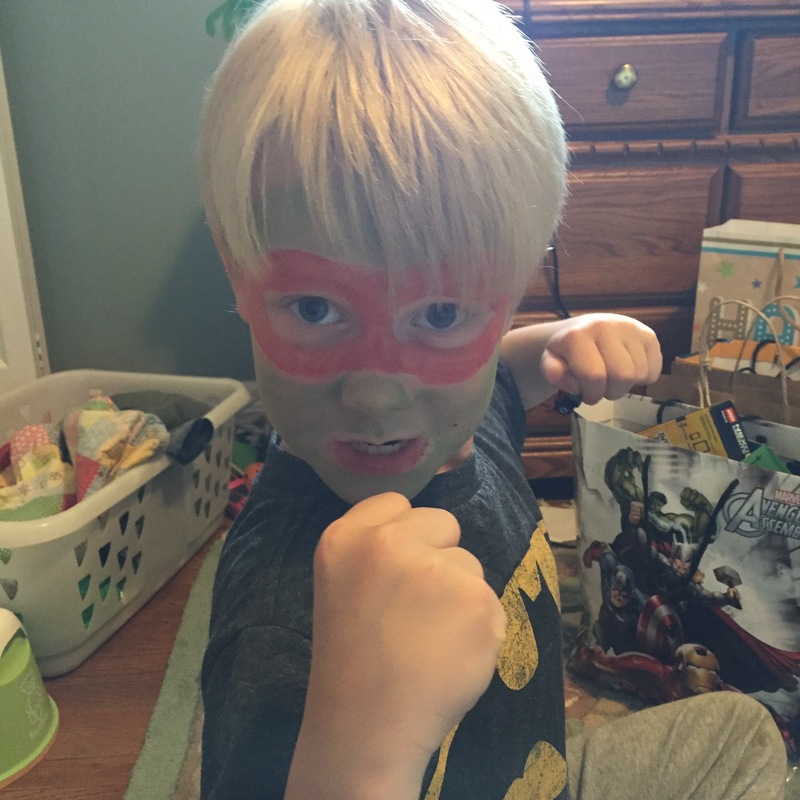 And I’m confident that he’s never felt deprived on his birthday, what with three sets of grandparents and lots of other people who like to celebrate him (/give him presents). And this year, with a bigger space to have guests over, it seemed like a good option to just invite E’s friends here. It’s what he wanted, and it’s the kind of party that’s familiar to me. 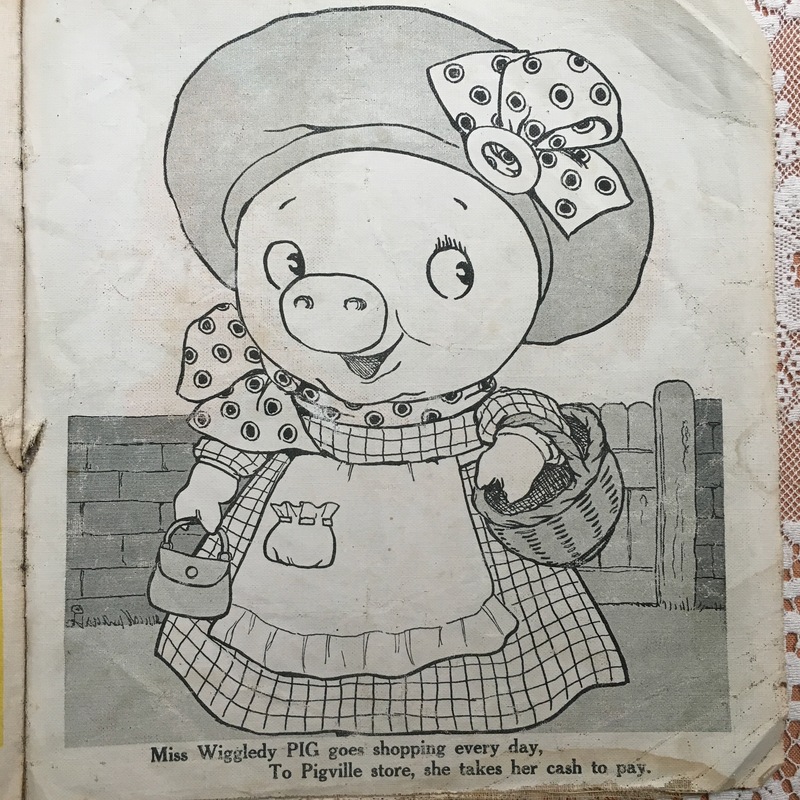 When I was a kid (E and AB just adore the stories that begin like this – no, really!) we hung out in our friends’ rec rooms and pinned tails on things and duck-duck-goosed each other, and sometimes there were piñatas, and usually balloons, and always loot bags, and I remember one long conversation about barfing at the lunch table of one friend’s party. Uncomplicated fun. Nowadays, I’m frankly intimidated by the standard for birthday parties. It seems many parents either go all out on a coherent theme (e.g. 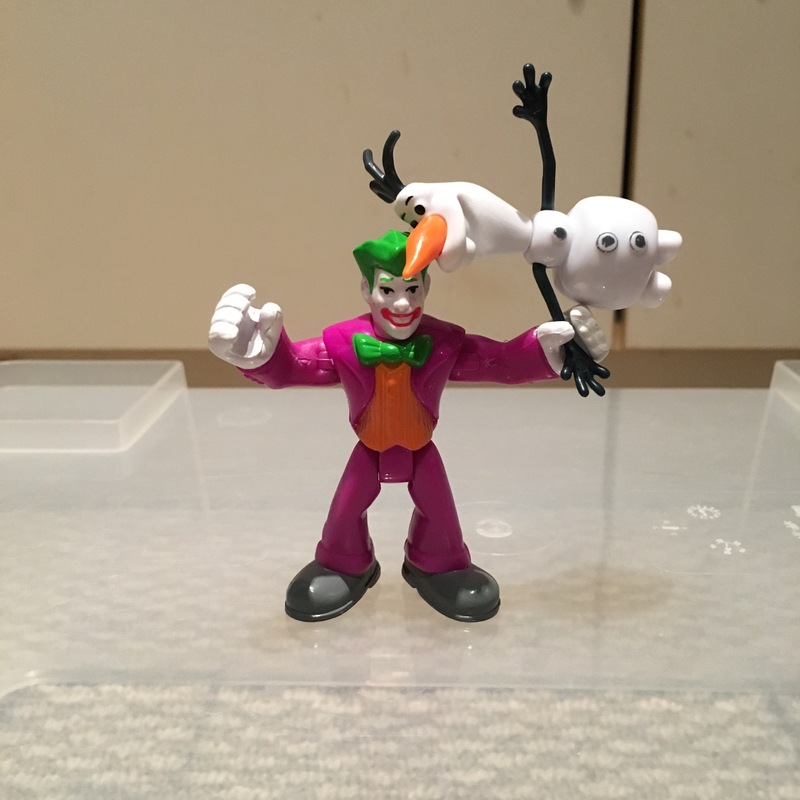 Frozen, Ninja Turtles, etc.) or book a venue… Or both. E has been invited to six different birthday parties this year: one at the movies, two at gymnastics places, and three at the new trampoline park. I understand that it’s nice not to have to think about how to entertain the kids – it’s built-in entertainment! And you don’t have to clean your house, before or after. I just balk at the precedent that’s set once I start booking venues – especially the financial part of it. 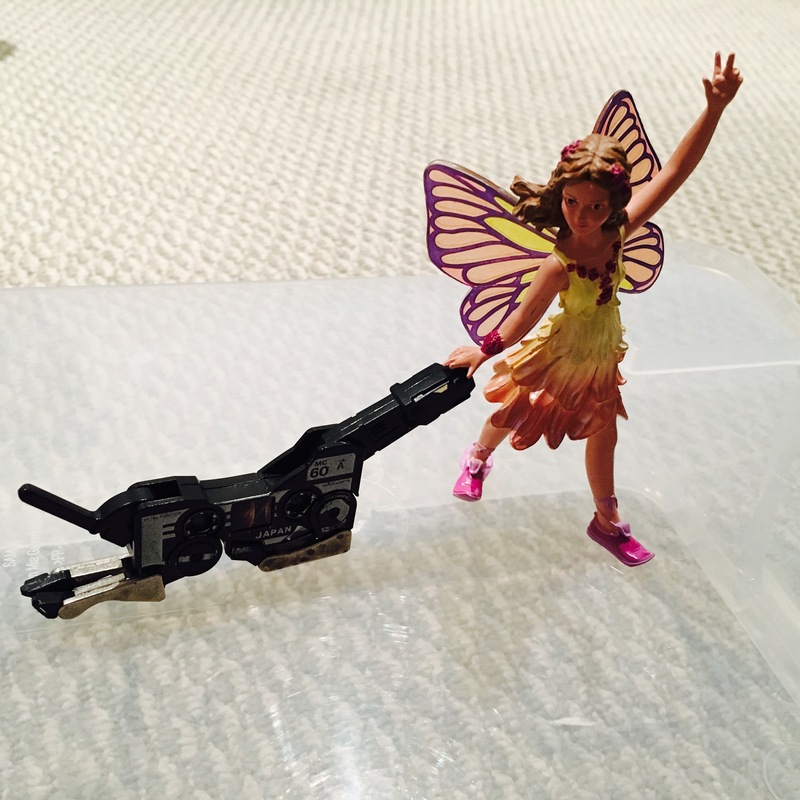 And now… I fully understand that eight seven-year-olds partying in your house is simply scary. We got everyone directly out to the backyard, where they immediately took the bait: soccer balls, Wham-O Trac ball and rackets, and E’s brand-new archery set with Nerf darts. But they didn’t stay there. They were all around the house, seemingly blown by the high winds that day, and suddenly some of them were inside – and they blew down to the basement and got busy redefining ruckus – and naturally one of the cats had puked on the carpet and Sean did some emergency cleanup and I lured them back outside with the mini-trampoline (not before there was a bit of puke-trackage, though). The next thing I knew, three or more of them were back in, tromping up the stairs towards the “secret closet” (storage area only tall enough for kids to stand up in) and the bedrooms. NO WAY, dudes. So back out they went, but I still had to tell my own son and one friend NO SECRET CLOSET one more time before they took me seriously… Because of course, E had become a wild wired wacko of a birthday boy in the intoxicating presence of his friends. Inside voices be damned. AB was joining in where she could, hopping on the trampoline and yelling, “This is the BEST PARTY EVER! !” like a kid in an 80s movie. The boys mostly know her from the school yard and they were nice enough. But I couldn’t help but worry that we were going to lose somebody, or that there would be grievous bodily harm of some sort. Even with three adults on the premises, it felt like a spiralling crazy-fest. And then, Auntie Beth worked the magic. 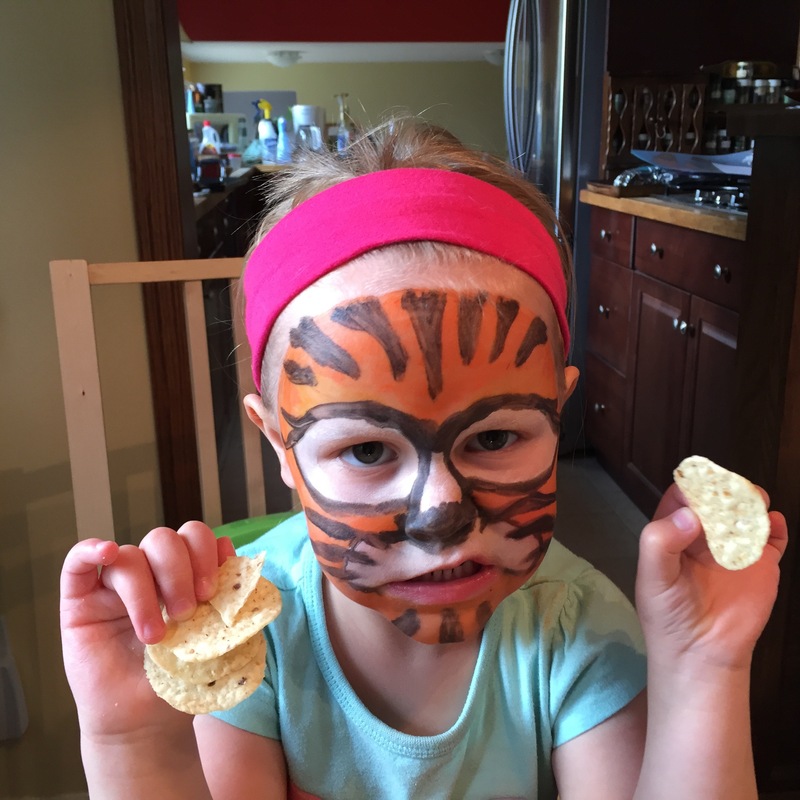 We had asked E if he minded sharing his brand-new face paints from Auntie Emi, and Beth just sat outside and painted a tiger face on AB. And wouldn’t you know it, those hurricane-kids lined up. Some for at least half an hour. Quietly. Watching the painting, discussing what they wanted on their faces. 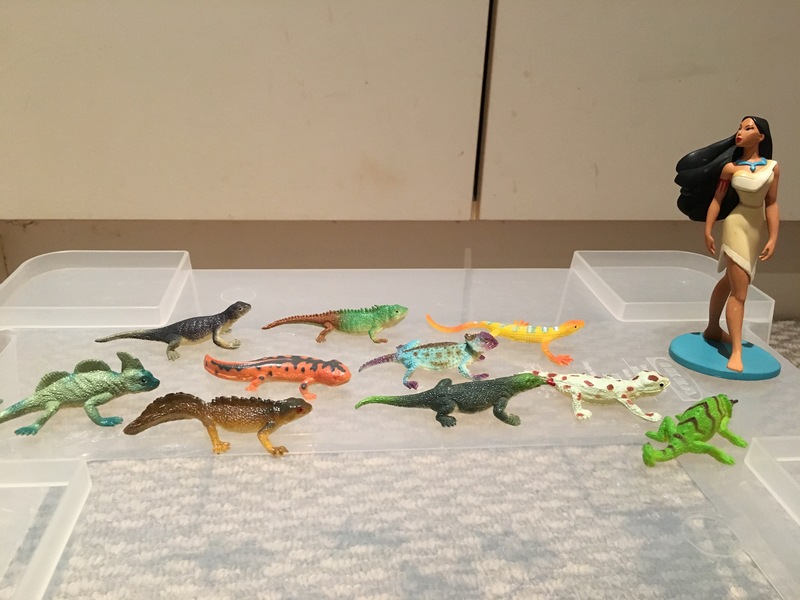 I reminded them, “You can go play while W. is getting his face painted, if you want,” and they were all, “But we’ll lose our place in line!” We even opened presents on the patio while the painting was happening, and the calm remained. Would we do it again? Hmm… We’ll just see how we’re feeling at this time next year.